The Advisory Board of the National Mathematics Summer School is pleased to announce the appointment of Professor Ben Burton as Director for 2019–21. Prof. Burton is from the School of Mathematics and Physics at the the University of Queensland. He has been involved with the NMSS as a tutor and lecturer for many years, so is well acquainted with the school and many of the people involved. Ben’s other contributions to inspiring our next generation of mathematicians and computer programmers include involvement in both the Mathematics and Informatics Olympiads – as Australian Director of the latter for its first ten years. Women & Leadership Australia is administering a national initiative to support the development of female leaders across Australia’s education sector. The initiative is providing women with grants of between $3000 and $8000 to enable participation in a range of leadership development programs. Expressions of interest close 16 March 2018. Go to www.wla.edu.au/education. Day of STEM will be continuing and adding to its programs for students and teachers in 2018. To find out more, go to http://dayofstem.org/australia/education/whats-on-in-2018. ACARA has released the National Literacy and Numeracy Learning Progressions – a new tool to assist teachers in implementing the Australian Curriculum: English and the Australian Curriculum: Mathematics. The learning progressions are to support teachers in locating where individual students are in terms of their literacy and numeracy development, and to help teachers understand the typical sequence of learning for literacy and numeracy. AMSI would like to invite Year 9–12 female maths students and their teachers to attend a special International Women’s Day event on 8 March 2018, 10.30 am – 12.30 pm at the IMAX Melbourne. The free event will showcase AMSI's new career videos, allow students to meet these ambassadors and hear from inspiring women working in maths. For more information and to register, go to http://choosemaths.org.au/intwomensday. The 14th Annual Conference of the International Society for Design and Development in Education (ISDDE) will be held 28–31 May 2018 at the National University of Ireland, Galway, with the theme "Culture and Educational Design". 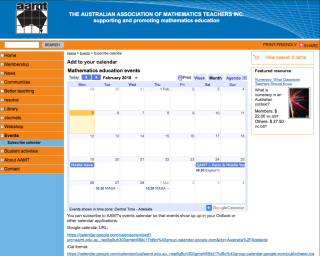 Besides listing national and international events on its website (see wwwaamt.edu.au/Events), you can now add AAMT's Mathematics Education Events Google calendar to your electronic calendar of choice. Go to www.aamt.edu.au/Events/Subscribe-calendar to get your fill of professional learning events! More than 60 different and interesting ways to build mathematical practices, differentiate instruction and increase student engagement. The approaches are based on four distinct mathematics learning styles: mastery, interpersonal, understanding, and self-expressive. Using activities which address different learning styles enables all students to think and work in their preferred style, and makes the task of differentiating instruction and assessment more manageable. Intrigue and stimulate your students with novel teaching and learning approaches. 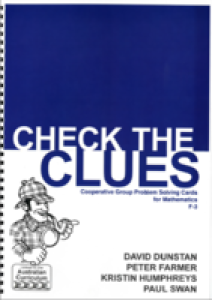 A collection of activities where students (F–3) work in groups and receive cards with different clues about a problem. 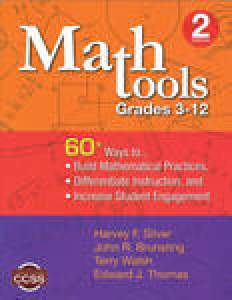 The activities cover all three strands of the mathematics curriculum and have comprehensive teacher notes. What Are Your Teaching Fundamentals? Teacher attrition: What’s the real picture?